The Kiddush cup (above left and right photo) was stepped on during a robbery and folded in half. Getting it back to normal and fixing the rolled edge was a challenging restoration. 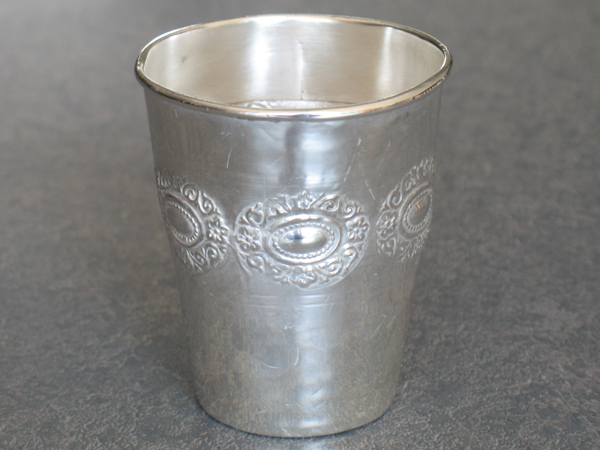 The Kiddush cup (left) had dents removed and then it was polished. It is about 2" high which is an indication of it's great value in another time and place when owning even a small silver cup was a big deal. Repair of this 20th century sterling silver filigree Kiddish Cup was complicated by the badly damaged filigree stem and stones. 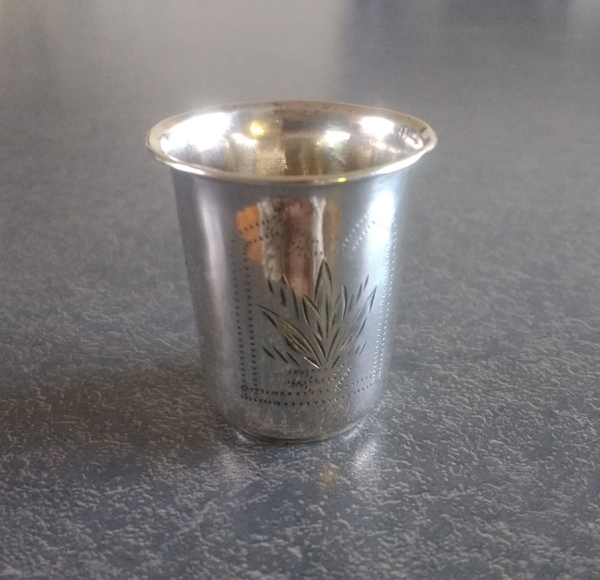 I could repair the silver filigree, but in an effort to reduce the cost of the repair, the damaged filigree stem was removed, and the cup was attached directly to the base. This worked out to be an attractive solution. Cutting off the damaged stem and fitting the cup into the base was a strong and attractive repair that cost considerably less and the cup is still usable. This sterling silver Kiddish Cup arrived for repair after it was chewed up very badly in the garbage disposal. The photo (left) doesn't begin to show the extend of the damage because I started working on the cup before thinking that it should be photographed. It was so chewed up that part of the edge was actually missing. It also was folded over on itself, the top edge was ripped and torn in two places. There were also several holes along with severe gouges, dings, and damage to the chased and repoussé design on the side. Frankly, I didn't even want to repair this cup but it held great sentimental value for the customer. Neither the customer nor I were sure that anything could be done to restore the kiddish cup. For this situation, the customer and I agreed to work on it incrementally, investing a moderate amount of money each time, and evaluating the next step. I would work on the cup and document the improvement. Each time the customer agreed to spend more money as this Kiddish Cup was restored. While not perfect, it is water tight, and back to it's original shape. This sterling silver besamin spice box in the shape of a flower arrived with a leaf broken off which meant it fell over to the side. For this example of Judaica, the attractive leaves on the side provided stability. Fortunately, I was able to repair the leaf adding an attractive patch on the back for additional strength. I can repair or polish your Menorah. 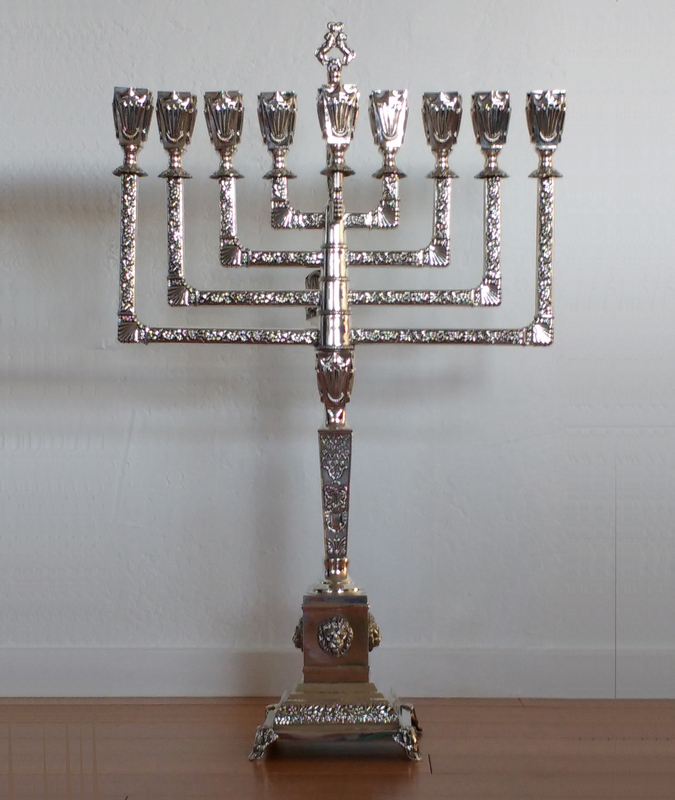 Click here to see examples of menorahs that have been polished, repaired or restored. Menorahs for Hanukkah always have 9 candles and possibly several arms. This makes them especially vulnerable to problems of candelabra and candlesticks. A frequent inquiry is about replacing a missing shamash. There are no replacement parts available. I can make anything, but it will be custom work. View more menorah repairs and polishing by clicking here.